View More In Heel Cushions & Cups - Page 10. WHY choose the multi- function VALUE PACK ? 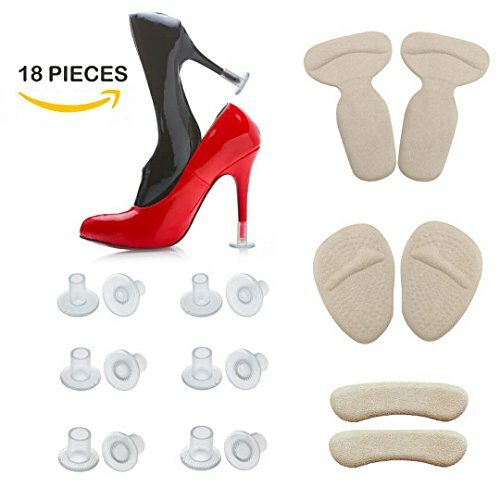 High heel protector-----Solve the sinking and slipping problem when ladies take grass wedding, outdoor graduation, beach party and Country walk. Heel Liner -----It can prevent blisters, Burning Pain from a long walking. Good stickiness favorable to keep them in place firmly when dancing, shopping, and running, etc. T-shaped Insole Liners-----It is used to protect your heels from blister and pain. Also, Relieve leg fatigue and soreness caused by long-time walking and standing. Anti-slip metatarsal pads--It is designed with raised point and bar to prevent foot slipping forward. Soft POLYMER GEL can relieve pain and calluses on toes. Soft massaging feel would be with you for a whole day walking and standing. 1pair of anti-slip metatarsal pad. One order cost meet all your needs. 3. Made of polymer biomaterials called "Manmade fat", so the liner and pad are super soft and comfortable. 4. The surface of liner and pad is hygroscope and volatilizing fiber that can prevent foot odor and slipping. 5. All the heel liner and pads are washable and can be used repeatedly at least 1000 times. 1. Use heel liner or pad inside the loose shoes to avoid causing your feet discomfort due to squeezing. 2. Adjust the sticked position until you feel comfortable. We hope you can enjoy the beauty and comfort at the same time with your family and friends! GOOD NEWS >>> 3- year Anniversary celebration! Buying the Value Pack to attend lucky draw, 100% winning rate, get 3 to 100 dollars lucky money! Valid date till Aug 26,2018. 9 PAIRS MULTI-FUNCTION VALUE PACK>>>Comes with 6 pairs High Heel protectors to stop sinking,1 pair Heel Liner to prevent rubbing, 1 pair T-shaped pad to stop heel pain and blister, and1pair Padded Forefoot Insoles to protect your ball metatarsal from pain and callus. LATESTANTI-SLIPTHREAD DESIGN>>>New anti-slip thread design is adopted on heel protectors. It can be more effective to prevent slipping and sinking, when walking on grass，beach, countryside etc. There are Small ,Medium and Large sizes and 2 pairs for each in the package. WASHABLE and REUSEABLE>>>The Heel pads is washable and can be used repeatedly at least 1000times.It is easy to take it off without residual on shoes. MAXIMUM COMFORT from QUALITY POLYMER GEL>>>The heel cushions are made of polymer biomaterials that can be called "Manmade fat ", getting the balance of maximum softy and flexibility. Adopt hygroscope and volatilizing fiber for the surface of heel grips and pad to prevent foot odor and slipping. If you have any questions about this product by BRUWEN, contact us by completing and submitting the form below. If you are looking for a specif part number, please include it with your message.